You're almost finished with your poster project. Right now, your golf-ball shape is simply a composite, solid-white shape, unlike the golf ball you saw in the sample End file. You'll create the same results with very little effort by applying layer styles to the custom shape. 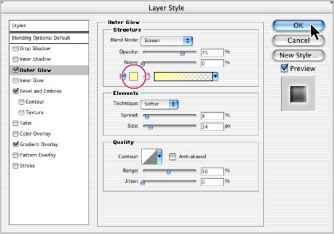 1 In the Layers palette, make sure that the Shape 2 layer is selected. 2 Click the Layer Style button (■£) at the bottom of the Layers palette, and choose Bevel And Emboss on the pop-up menu that appears. 3 Make sure that the Preview check box is selected and then move the Layer Styles dialog box so that you can watch the changes to the golf-ball shape as you make style selections. • For Technique, use Smooth. 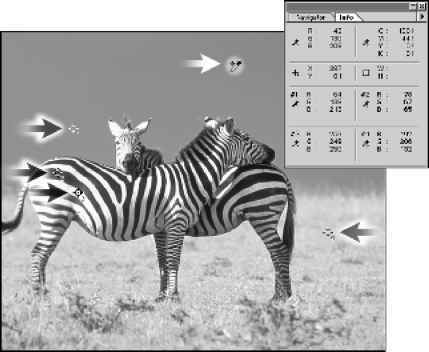 • For Depth, type or drag the slider to set the value at about 150%. • For Soften, type or drag the slider to set the value at 6 px. Do not close the dialog box yet. • For Angle, use -41° (being careful to make the number negative). Leave the dialog box open for the next step. 6 In the Styles list on the left pane of the Layer Style dialog box, select the Gradient Overlay check box. Do not click OK yet. • In the Structure section, click the color swatch to open the color picker, and select a pale yellow color by setting the following values: R=255, G=255, B= 190, and then click OK to close the color picker. • In the Elements section, leave Technique set as Softer, enter 8% for Spread, and enter 27 for Size. 8 Review the settings and then click OK to close the dialog box. Although you opened the Layer Styles dialog box just once, you applied a total of three different layer styles: Bevel and Emboss, Gradient Overlay, and Outer Glow. 9 If necessary, click a blank area in the Paths palette to deselect the Shape 2 Vector Mask, and then save your work. Congratulations! You've finished your work on the poster.